Yu-Gi-Oh! 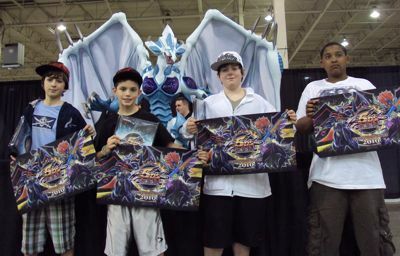 TCG Event Coverage » Dragon Duel Final Feature Match: Jarryd K. vs. Danny R.
Home > 2010/05 - Washington, DC, Yu-Gi-Oh! Championship Series	> Dragon Duel Final Feature Match: Jarryd K. vs. Danny R.
Dragon Duel Final Feature Match: Jarryd K. vs. Danny R.
Jarryd is running a Quickdraw Dandywarrior Deck, and his opponent, Danny, is running Machina Gadgets! Jarryd won the dice roll and chose to go first. He opened up with Brain Control, Quickdraw Synchron, Plaguespreader Zombie, Caius the Shadow Monarch, Super-Nimble Mega Hamster, and Starlight Road. He Set Super-Nimble Mega Hamster and ended his turn. Danny Summoned Red Gadget to the field and activated its effect, grabbing a Yellow Gadget from his Deck and adding it to his hand. Then he attacked the face-down Hamster with Red Gadget. Danny lost 500 Life Points and Jarryd Special Summoned Ryko, Lightsworn Hunter from his Deck in face-down Defense Position. Danny Set a back row and ended his turn. Jarryd drew Giant Trunade next turn. He activated it to send Danny’s Set card back to his hand, and then discarded Plaguespreader Zombie to Special Summon Quickdraw Synchron to the field. Then he Tributed Super-Nimble Mega Hamster to Summon Caius the Shadow Monarch, and activated Caius’s effect to remove Red Gadget from play. Then he flipped Ryko and sent 3 cards from the top of his Deck to his Graveyard without destroying any cards. He Tuned Ryko to Quickdraw Synchron in order to Synchro Summon Junk Archer! Caius and Junk Archer both attacked directly, dropping Danny to 2800 Life Points. In Main Phase 2, Jarryd Set Brain Control and Starlight Road to his back row. Danny Summoned Machina Gearframe next turn and activated its effect to search his Deck for Machina Fortress and add it to his hand. Then he pitched Jinzo and Machina Fortress to Special Summon the Fortress back from the Graveyard. Fortress attacked Junk Archer and it was destroyed. Danny Set a back row and ended his turn. Jarryd drew Card Trooper next turn. He activated Brain Control by paying 800 Life Points and took control of Danny’s Fortress. Then he attacked with the Fortress and destroyed Machina Gearframe with it. Next, Caius scored a direct attack, ending the Duel! Danny R. will be going first in Duel 2! He Summoned Red Gadget to the field and activated its effect to search his Deck for a Yellow Gadget and add it to his hand. Then he Set 2 back rows and ended his turn. Jarryd opened up with Giant Trunade, Dimensional Prison, Quickdraw Synchron, Ryko, Lightsworn Hunter, Charge of the Light Brigade, and Cyber Valley. He activated Giant Trunade to send both of Danny’s cards to his hand. Then he Set Dimensional Prison and discarded Cyber Valley to Special Summon Quickdraw Synchron. Next, he activated Charge of the Light Brigade and sent Lonefire Blossom, Solemn Judgment, and Debris Dragon from the top of his Deck to his Graveyard to grab a Ryko from his Deck and add it to his hand. Then he Normal Summoned Ryko and Tuned it to Quickdraw Synchron to Special Summon Junk Archer from his Extra Deck! Junk Archer attacked Red Gadget, destroying it and dropping Danny to 7000 Life Points. “Your move,” Jarryd said. Danny Summoned Machina Gearframe next turn and activated its effect to Special Summon Machina Fortress from his deck. Then he activated Solidarity to boost all of his machines by 800 ATK. Next, he attacked Junk Archer with his 2600 ATK Gearframe, but Jarryd flipped Dimensional Prison to remove Machina Gearframe from play. In Main Phase 2, Danny discarded Yellow Gadget and Machina Fortress to Special Summon the Fortress back to the field. Danny Set 2 cards and ended his turn. Jarryd drew a card and Set Ryko next turn, along with a Bottomless Trap Hole. Then he removed Machina Fortress from play with Junk Archer and declared an attack, but lost his Archer to Dimensional Prison. Fortress came back to the field in the End Phase. Danny activated Nobleman of Crossout next turn to remove Jarryd’s Set Ryko from the game along with a copy from his Deck. Next, Danny Normal Summoned Scrap Recycler and activated its effect to send Shreddder from his Deck to his Graveyard. Then he used Recycler to send Shreddder and Red Gadget from his Graveyard to his Deck and draw a card. Next, Danny played Mystical Space Typhoon to destroy Jarryd’s Set Bottomless Trap Hole. Then, he attacked directly with his 1700 ATK Recycler and 3300 ATK Fortress. Jarryd drew Caius next turn and ended his turn, unable to make a play. Danny played Solidarity next turn and Jarryd was taken out by Danny’s two Machines. Jarryd chose to go first in Duel 3! He opened up with Mirror Force, Dimensional Prison, Giant Trunade, Quickdraw Synchron, Cyber Valley, and Pot of Avarice. He Set Dimensional Prison and Mirror Force. Then he Normal Summoned Cyber Valley and ended his turn. Danny played Mystical Space Typhoon to destroy Jarryd’s Mirror Force next turn, and then activated Heavy Storm to destroy Dimensional Prison. Next, he Summoned Yellow Gadget and activated its effect to search his Deck for Green Gadget and add it to his hand. Yellow Gadget attacked Cyber Valley, but Jarryd removed Cyber Valley from the game to draw a card and end the Battle Phase. Jarryd drew Caius with Cyber Valley’s effect and Danny ended his turn. Jarryd drew Mystical Space Typhoon next turn and Set it before passing back to Danny. Danny Tributed his Yellow Gadget to Summon Jinzo next turn and attacked directly with it. He ended his turn without a back row. Jarryd drew Heavy Storm next turn. 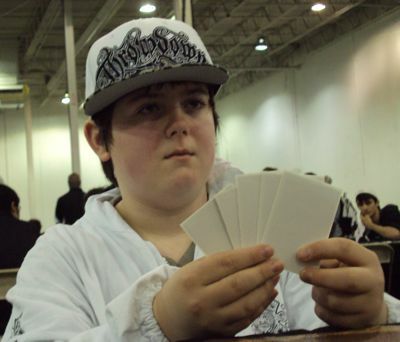 He had plenty of Spell and Trap Card destruction, but Danny had no Spells or Traps Set. Jarryd passed, unable to make a play. Danny Summoned Green Gadget next turn and activated its effect to add a Red Gadget from his Deck to his hand. Then he attacked directly with Jinzo and Green Gadget, dropping Jarryd to 1800 Life Points. Jarryd drew Solemn Judgment next turn, but Jinzo was still face-up on the field so he couldn’t activate it. Desperate to survive, he discarded Caius to Special Summon Quickdraw Synchron in Defense Position. Then he Set Solemn Judgment and ended his turn. Danny Summoned Jinzo – Returner next turn. He attacked directly with it thanks to its effect, dropping Jarryd to 1200 Life Points. Then he attacked Quickdraw Synchron with Jinzo, destroying it, and Danny finished Jarryd off with a direct attack from Green Gadget! Danny R. takes a 2-1 victory over Jarryd K. to become the Dragon Duel Champion for the weekend! Game 1 saw some deceptively sharp play from Jarryd K.. Early in the Duel, Jarryd used Giant Trunade and Caius the Shadow Monarch to clear the field. He Flip Summoned Ryko, Lightsworn Hunter without using its destruction effect, and Tuned it to Quickdraw Synchron for Junk Archer. He attacked for 4700 Battle Damage that turn. That whole turn seemed completely overzealous from Danny’s side of the table: it looked as if Jarryd had used Trunade when he could have just destroyed Danny’s 1 Set card with Ryko, then wasted his Ryko’s effect anyways. That impression led Danny to try and capitalize with Machina Gearframe and Machina Fortress, and that’s exactly what Jarryd wanted to see. With Machina Fortress and Caius still on the field, Jarryd would take Fortress with Brain Control and go for the win. In Duel 3, Danny activated Mystical Space Typhoon to destroy one of Jarryd’s Set Trap Cards and then followed up with Heavy Storm to destroy the other one, instead of just starting off with Heavy Storm. This was a calculated decision for Danny. 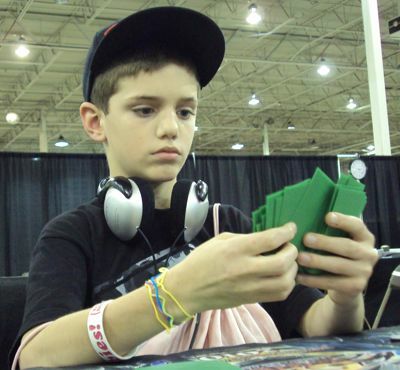 He knew that Jarryd played Starlight Road in his Deck and expected Jarryd to have it face down. He was unable to take down a Stardust Dragon and wanted to make sure he didn’t trigger the Starlight Road. He also knew that he’d be Summoning Jinzo next turn, making it so that all Trap Cards Jarryd Sets in future turns wouldn’t be a threat. Because of this, he knew that he didn’t need to hold on to his Mystical Space Typhoon. This type of foresight displayed by Danny R. is the mark of a Dragon Duel Champion! In a Machina Gadget Deck, pretty much all of your monsters are Machine-Type. That makes Solidarity a powerful tool to use. With Solidarity, your monsters will always get an 800 ATK boost, since you’re only using 1 Type of monster in your Deck. Gadgets and Machinas are tough enough to deal with when they have their original ATK, but 2200 ATK Red Gadgets that search for 2000 ATK Yellow Gadgets can strike fear into almost any opponent.